Village Eggnog Factory, Pack of 2, PartNo 65141, by Lemax Inc Lemax Inc 65131 728162651310. Village Eggnog Factory, Pack of 2, by Lemax Inc, Mfr Part Number 65141 Item Length: 6 ItemWidth: 8 ItemHeight: 6 ItemWeight: 1 PackageLength: N/A PackageWidth: N/A PackageHeight: N/A PackageWeight. 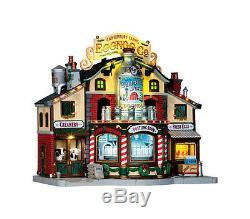 The item "Village Eggnog Factory, Pack of 2, PartNo 65141, by Lemax Inc" is in sale since Tuesday, March 28, 2017. This item is in the category "Collectibles\Holiday & Seasonal\Christmas\ Current (1991-Now)\Villages & Houses".